Before I even stepped foot on that plane I knew I was already done. Done trying to make sure I was prepared to meet with publishers. Done with writing out my speaking message. Done wrestling with God since He was the one who summoned me to the conference. Here I am Lord, send me…..oh, but don’t send me there, was my heart attitude. By the time I left the airport of Los Angeles, California and landed in Charlotte, North Carolina I had been awake for 33 hours straight. Sleep deprived wasn’t how I planned to start my conference weekend, yet the circumstances surrounding this situation was what the Lord allowed. At the time I didn’t fully understand why it was best for me to head into a ministry conference so unrested but as the days and nights went on, I could see part of the Lord’s plan in all of this start to unfold. When you’re exhausted, you don’t really care what anyone else thinks of you. You could care less how the publishers view you when you pitch your book idea to them. Or how your speaking group will evaluate you. Or if those around you will accept you or not. No, not one of those things really mattered when you’re just trying to stay awake and continue the course at hand. Exhaustion peels away a lot of anxiety and doubt that swirls through one’s mind. In fact, exhaustion left me at my weakest. I was mentally, emotionally and physically spent. My role in ministry is simply to do my part. To show up and answer God’s call. In the simplest of terms- it’s to be obedient. God’s role in ministry is to move in the hearts of the people. And God did move. And I was emotionally overwhelmed because of it! I felt so encouraged, accepted and loved while I was at the conference especially since I often don’t feel like I fit into the writer’s world. Here I am with my sweet, online friend, Bonny who blogs over at Pearl’s Oysterbed. The Lord connected the two of us a over a year ago through blogging and this sweet angel ministered to me greatly over the weekend. I’m so blessed that she was by my side helping me out! I’ve said before that it’s not my dream to become a writer/author. I minister here on-line out of obedience to my King regardless of my issues and insecurities. What makes my heart beat fast is to be used by Him to encourage and equip His daughters to draw closer to Him. And then throughout the conference I’d start to cry at the drop of a hat because I began to see part of His plan for my life start to unfold. Oh to be used by the Great I Am! My heart became so overwhelmed (still is) to realize that God could use someone like me for such a high purpose. A purpose to lift His name on high to all who are willing to listen. I feel so unworthy to carry out this task. 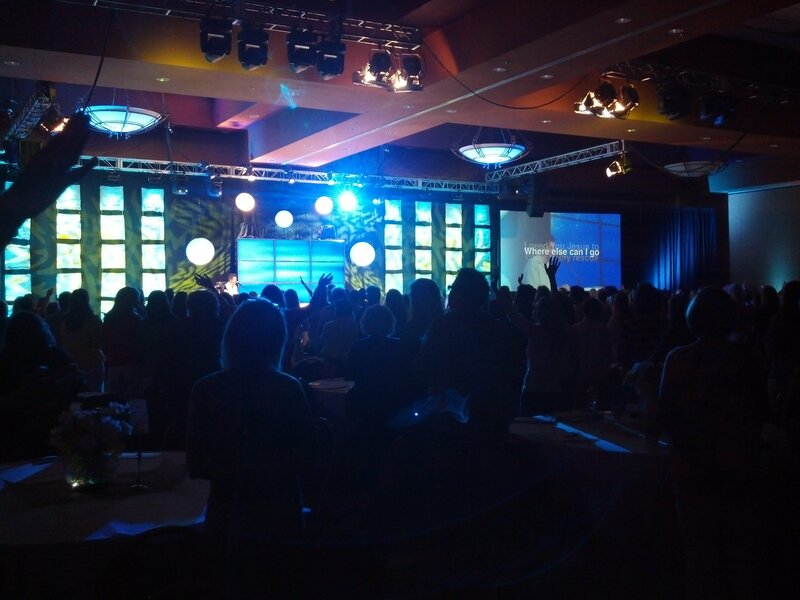 And then I looked out over the ballroom to a sea of over 700 women who are very much like myself. God has given them a purpose. And they too are filled with insecurities. Where is God calling you today, friend? Are you willing to step out in faith when He tells you to go? Did you enjoy reading The Alabaster Jar? To receive future posts you can just enter your email address below or like my page on Facebook. « Are You Speaking Words of Life into Your Marriage or Are You Tearing It Down? I’ve always thought of writing to you but then I’m busy and you probably are too busy to even read my comment until today when the Holy Spirit said to me:’ hey everyone needs to be encouraged. How do you know? She might need it just today. Just from you. ‘ so I dared to write finally. I wanted to say what a great blessing to me and my sisters in Christ( from my church) you are. I receive you devotions by email and I must say that even though I’ve never met you( hey I’ll see you in heaven) I just love you. I love your sence of humour and your honesty but most of all that you just love Jesus and wants to please him in whatever you do. You have ministered to my heart and my sisters’ so many times. I always forward your emails to others. I pray for you and thank God that He’s put you here to minister to our hearts. This is so precious. Thank you. Personally I’ve put into practice a lot of the things you suggested in your posts when it comes to my marriage and kids and The Lord has used you in a wonderful way. So thank you dear Jolene. Please keep sharing stuff with us as you can’t even imagine how needed and precious everything that The Lord tells you to write it is. Your words of encouragement brought tears to my eyes! Thank you for taking the time to minister to me. I’m completely humbled by all that you have shared. That was a blessing! It is true when your so tired mental, physically, emotionally you can remove the mask and just let The Lord do His will. You both looked beautiful in the picture! Thank you! And yes, sometimes God has to take us through things so we’ll just accept His path and let Him do His will! Thank you Jolene for your blog. It’s a huge source of encouragement and a huge blessing. May God continue to give you grace for His work and calling and like you always say, live a poured out life for Christ. Awe, thank you sweet friend! 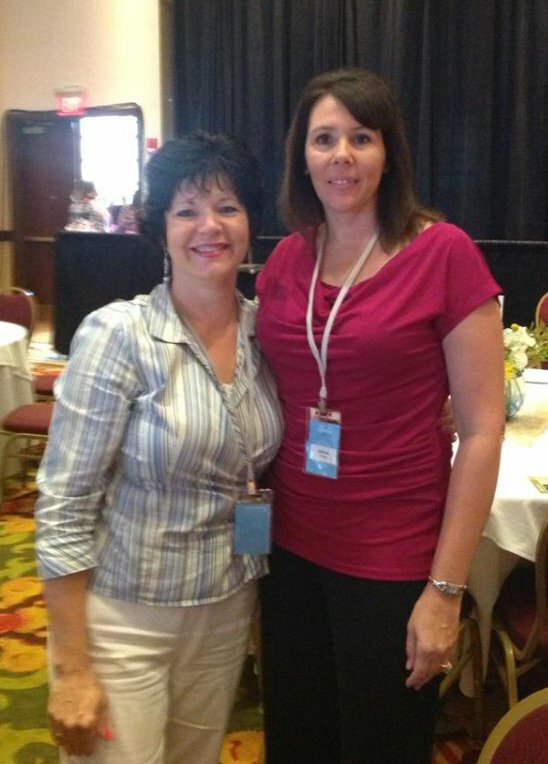 My sweet sister blogger, what an incredible, Spirit-filled weekend we experienced together. I too am overwhelmed with the power of being called of God. Remember, blow some bubbles and celebrate! Because, even in our humility we can savor the joy of being used as God’s vessel. I know you’ll keep writing for HIM. I will, too. Meet you next year in Charlotte. 🙂 I love you! Love you too, Bonny! But um, 5 airplanes later and almost 24 hours of travel time I’m not quite sure that I’m willing to fly to North Carolina again! Quite frankly, they need to have a conference like that on the west coast! Glad to know that the conference went well. I know you were encouraged and I look forward to continue reading about all the Lord has shown you. May the Lord continue to bless you and your household. May He do wonderful things through you and the ministry He has so obviously laid before you. I look forward to buying your first book! Much Affection! Thank you, Cristina! Hope all is well with you and yours. Give your family our love. What a marvelous opportunity! God can really stretch us, can’t He? Glad you got to go! Yes, it was a beautiful opportunity. And yes, I was stretched! Maybe one day God will have you go?? Jolene, I came across your site quite by accident the other day. In fact, I jotted down your name (from somewhere – lol!) with the intention of looking it up, but two days later, on seeing your name written on a piece of scrap paper, I couldn’t remember why I had wanted to look you up. All that to say, God certainly works in mysterious ways, as they say. I have been a writer at heart ever since I can remember, and over the years, the lord has impressed me with different ways He wanted to use my writing to serve Him. Needless to say, lots of ideas, but total avoidance on my part! No matter how badly I have wanted just that, I haven’t been able to get over my fear and insecurities to really try. In recent months, I have come closer and closer to trying, but still am hesitant. But, reading your blog and been such an encouragement! At first, I felt a bit discouraged at the thought that in spite of different lives, we do seem to have similar things to say. But then I realized it’s all about Him, and serving Him by ministering to others in the way He has shown us to do. It certainly isn’t a competition, is it? We all have influence in different circles. Because of reading just a few of your posts, I am more confident of His plan and purpose for me in this! Thanks for being an inspiration. Awe, what a sweet comment, Sheri! Step out in faith, sweet sister! God is faithful. Thank you for the encouragement. I can so relate to the things you write about. I am hoping I will find my our voice (so to speak) as well! I did send you a friend request on Facebook and discovered we have several “mutual friends”. I don’t know if these are people you know personally, or just some who found your blog as I did, but that in itself was encouraging as well.